To boost the online presence, now days people are turning towards social media. Developing social media strategies to achieve the desired results has now become the part of every business. Every week social media marketers can be seen planning what to do next? Some may have proper idea as to what must be done while some are still in search of new ideas. Yes, here most of the social media marketers commit mistakes as they are completely unaware as to what one must include in their upcoming social media campaigns. Just posting updates related to brand is not sufficient. It is necessary to have a huge list of followers in order to enhance conversion rates. So, here this blog post from SEO Company Adelaide shows you some important tasks that must be considered every week when framing your social media checklist. Be Aware about Social media statistics: It is necessary to keep a constant check on your social media statistics as this will show you how your strategy is performing and how much improvement is needed in the strategy. Hence, experts believe that social media statistics must be checked on weekly basis. This shows what is working and what is not. Maintain the track of the posts that are working, those that need more attention and more. This will show you more ideas to improve your content. Always keep a check on the number of clicks as well as re-shares of each and every post. One can take a look at the number of views these posts have received. 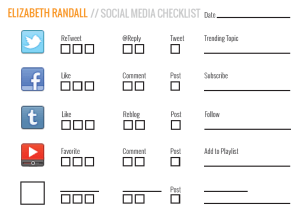 Keep in touch with Influencers: Daily social media checklist must get engaged with the audience. Apart from audience, one must also get engaged with the industry influencers. This throws out maximum opportunities to reach to those people who are not included in your circle. No, it’s not necessary that your influencers must be famous celebrities or politicians. These can be any people having tons of followers. These can also be the ones who have huge importance in the industry. The main thing is to develop your connections irrespective of worrying about the response. Posting an interesting comment will also serve the purpose. Take Part in Events: Stay updated about the events and be a part of these events. It can be any Google Hangouts or Twitter chats. It is advisable to participate in any Hangout for Community managers in the industry. Keep your Advertisements up to date: Refresh your social media ads on weekly basis. Remove those that don’t generate any leads and always reframe the ones that offer you better results. The new ads will offer more value to the audience. Bring new tactics which will boost your upcoming social media campaigns. Show your plans about how will you stay engaged with your audience, thought leaders as well as marketing partners. These all strategies can be useful to you or may not be useful to you depending upon your business industry. Innumerable tasks are available which will be useful to you to strengthen your social media strategies. Hence, do a proper survey and then go for the one that actually suits your needs. Are there any tasks in your checklist that are mentioned here? Let us know how this blog post was helpful to you. Keep in touch with more such tips from Industry experts.